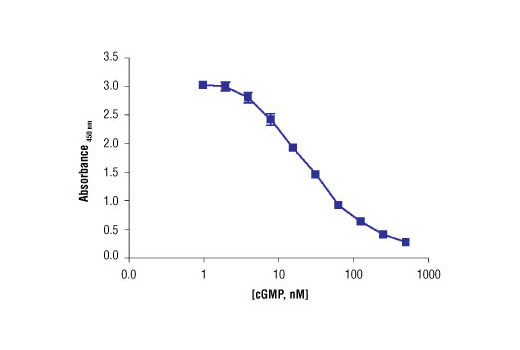 Figure 1: cGMP Standard was diluted in 1X Cell Lysis Buffer #9803 and samples were assayed following the Cyclic GMP XP® Assay Kit protocol. This standard curve is for demonstration purposes only; users should generate a standard curve for each sample set in order to accurately determine cGMP concentration. 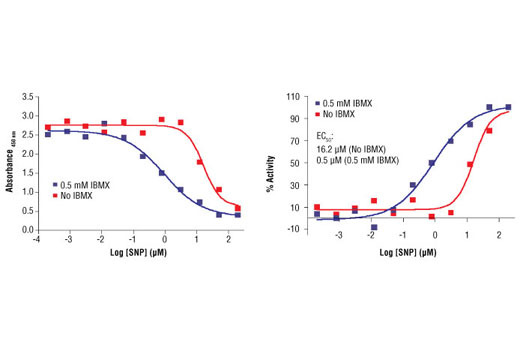 Figure 2: Treatment of RFL-6 cells with sodium nitroprusside (SNP) increases cGMP concentration as detected by Cyclic GMP XP® Assay Kit #4360. RFL-6 cells were seeded at 2x105 cells/well in a 12-well plate and incubated overnight. Cells were either left untreated or pretreated with 0.5 mM IBMX for 15 minutes prior to SNP treatment (30 minutes) and lysed with 1X Cell Lysis Buffer #9803. The absorbance values (left) and percentage of activity (right) are shown above. The percentage of activity is calculated as follows: % activity=100x[(A-Abasal)/(Amax-Abasal)], where A is the sample absorbance, Amax is the absorbance at maximum stimulation (i.e., high SNP concentration), and Abasal is the absorbance at basal level (no SNP). SNP is a nitric oxide donor that directly activates soluble guanylyl cyclases and increases cellular cGMP concentration. IBMX is a non-specific inhibitor of cAMP and cGMP phosphodiesterases that promotes accumulation of cAMP and cGMP in cells. 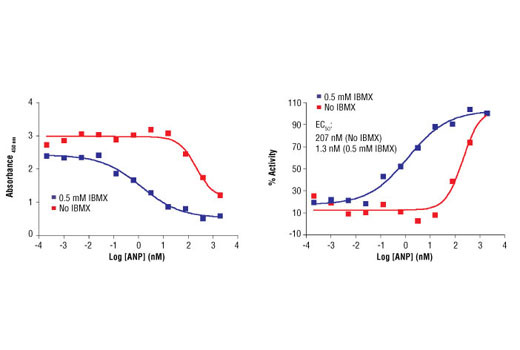 Figure 3: Treatment of RFL-6 cells with atrial natriuretic peptide (ANP) increases cGMP concentration as detected by Cyclic GMP XP® Assay Kit #4360. RFL-6 cells were seeded at 2x105 cells/well in a 12-well plate and incubated overnight. Cells were either left untreated or pretreated with 0.5 mM IBMX for 15 minutes prior to ANP treatment (30 minutes) and lysed with 1X Cell Lysis Buffer #9803. The absorbance values (left) and percentage of activity (right) are shown above. The percentage of activity is calculated as follows: % activity=100x[(A-Abasal)/(Amax-Abasal)], where A is the sample absorbance, Amax is the absorbance at maximum stimulation (i.e., high ANP concentration), and Abasal is the absorbance at basal level (no ANP). ANP is a ligand that binds and activates membrane bound guanylyl cyclases to increase cellular cGMP concentration. Prepare 1X Wash Buffer by diluting 20X Wash Buffer (included in each kit) in Milli-Q or equivalently purified water. Dilute the 10X Cell Lysis Buffer #9803 to 1X in Milli-Q or equivalently purified water. 1 mM phenylmethylsulfonyl fluoride (PMSF) should be added fresh each time. This buffer can be stored at 4°C for short-term use (1–2 weeks). NOTE: This procedure is for a 96-well tissue culture plate. It can be modified for other tissue culture plates (6, 12, 24, or 48 well). Plate cells of interest in 96-well plate (typically between 6–100 X 103 cells/well) and incubate overnight under appropriate cell culture conditions. Rinse cells with 200 μl warm PBS, then add test compounds in serum free mediums and incubate cells for the desired time period. Rinse cells twice with 200 µl ice cold PBS, and then add 100 μl/well 1X lysis buffer, keep cells on ice for 5 to 10 minutes. NOTE: If cell debris is observed it can be removed by brief centrifugation of the plate and transfer of the clear lysates to a new 96 well plate. Bring all kit components to room temperature. Add 50 µl of the HRP-linked target solution and 50 μl sample to the antibody-coated assay plate. Cover the plate and incubate at room temperature for 3 hours on a horizontal orbital plate shaker. Discard plate contents and wash wells 4 times with 200 μl /well of 1X Wash Buffer. Make sure to discard all liquid after each wash but do not allow wells to completely dry. Add 100 μl TMB substrate. NOTE: Watch the color as it being developed since it may be necessary to stop the reaction before 30 minutes. Add 100 μl STOP solution. Measure absorbance at 450 nm (for optimal results, read the plate within 30 minutes after adding STOP solution). NOTE: To determine the absolute amount of the tested substance, a standard curve needs to be generated each time. Please follow the detailed protocol on the product datasheet to determine the concentration range for the standard curve. The Cyclic GMP XP® Assay Kit is a competition enzyme-linked immunoassay used to determine cGMP levels in cells or tissues of interest. In this assay, cGMP found in test sample competes with a fixed amount of HRP-linked cGMP for binding to an anti-cGMP XP® Rabbit mAb immobilized onto a 96-well plate. Following washing to remove excess sample cGMP and HRP-linked cGMP, HRP substrate TMB is added to develop color. Because of the competitive nature of this assay, the magnitude of the absorbance for this developed color is inversely proportional to the quantity of sample cGMP. Measurement of absorbance using the cGMP Standard allows calculating the absolute amount of cGMP in a sample of interest. Note: 12 8-well modules - Each module is designed to break apart for 8 tests. The immunoreactivity of this kit was tested against the following: ADP, AMP, ATP, cAMP, cGMP, cIMP, cTMP, CTP, GDP, GMP and GTP. Minor cross-reactivity was observed with cIMP, with over 100 fold higher sensitivity for cGMP compared to cIMP. No cross-reactivity was observed with any of the other factors tested. Kit sensitivity, as shown in Figure 1, demonstrates a dynamic range of 2 to 200 nM of cGMP. Changes in cellular cGMP levels following specific treatments are shown in Figure 2 and Figure 3 (low passage RFL-6 cells). Cyclic guanosine 3’,5’-monophosphate (cGMP) is a critical and multifunctional second messenger molecule involved in many signal transduction pathways in different cell types of almost all species (1). Intracellular cGMP is generated from GTP by guanylyl cyclase (GC) and degraded through phosphodiesterase (PDE) hydrolysis (1,2). Two distinctive families of GC have been identified: soluble guanylyl cyclases (sGC) that are nitric oxide-responsive and cell membrane-bound, particulate guanylyl cyclases (pGC) that respond to diverse extracellular agonists including peptide hormones, bacterial toxins and free radicals (2,3). Phosphodiesterases form a superfamily of 11 isoforms with different specificity to both cyclic adenosine 3’,5’-monophosphate (cAMP) and cGMP (4). Cyclic GMP regulates cellular physiology by activating cGMP-dependent kinase, modulating cGMP-dependent ion channels or transporters, and altering its own hydrolytic degradation by phosphodiesterase (PDE) (1,4). Because of the diversity of its effectors, cGMP plays an important role in regulating various pathological and physiological processes, such as vascular smooth muscle motility, intestinal fluid and electrolyte homeostasis, and retinal phototransduction (1,5). Domek-Łopacińska, K. and Strosznajder, J.B. (2005) J Physiol Pharmacol 56 Suppl 2, 15-34. Lucas, K.A. et al. (2000) Pharmacol Rev 52, 375-414. Potter, L.R. et al. (2006) Endocr Rev 27, 47-72. Matsumoto, T. et al. (2003) J Smooth Muscle Res 39, 67-86. Rybalkin, S.D. et al. (2003) Circ Res 93, 280-91.